Good morning sweets, how are you? I am good, except I’m having a little bit of hair disaster going on. Since I came back from the seaside my hair has been über dry and brittle, which is quite odd as I was doing my best to protect it from the UV rays and the salt water… Anyway, my best friends in this hair combat have been the incredible Macadamia products, which I’ve mentioned before. 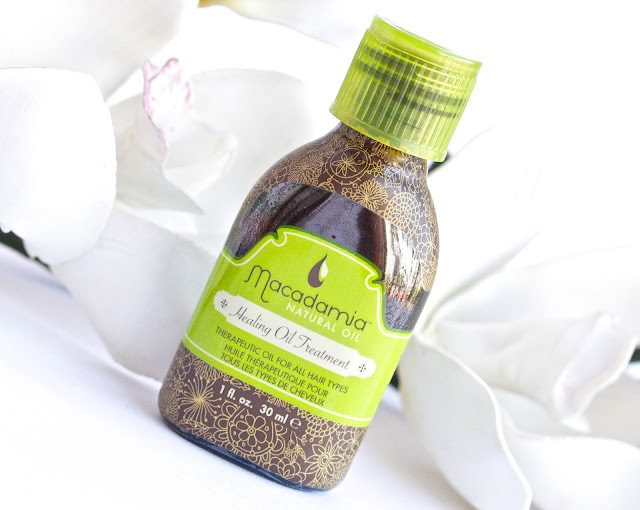 Since I confessed my true love for their Rejuvenating Shampoo (review here) and their Deep Repair Hair Mask (review here), I think it’s time to talk about another one of my Holy Grail Macadamia products – the Healing Oil Treatment. I usually like to use this hair oil in two ways. The first one is when my hair’s damp, I just pour some oil onto the palms of my hands, warm it up a bit and carefully disturb it all over the lengths of my hair (from my ears down). Then I just comb through and blow dry. The second way I like to use this is on dry hair. I use a teeny tiny bit just on the ends of my hair to make them look less brittle and more polished. I just recently started dong this and I love how it works, plus I use any left product I may have on my palms to smooth out the rest of my hair if it’s gotten a bit frizzy and wild. :) Also, once a week I mix some of the treatment oil with Macadamia’s Leave In Cream for deeper nourishment and I kid you not – this makes my hair incredible and it’s really soft and tangle-free. Have you tried the Healing Oil Treatment before? Which is your favorite hair oil? Since I just changed the colour of my hair to lighter, after bleaching it, this product might be a good fit for me. Although I've also read some great things about the Moroccan Oil one. Thank you for your post, I really need this for my dry hair! Thanks for this! I've been struggling massively with dry and frizzy hair at the minute, no matter what I do. Will probably end up purchasing the Macadamia products, as they seem to always get near-rave reviews! the product seems to be very good ! I was just looking for a treatment oil for my bleached hair. Thanks for the tip, it will be my next purchase from Amazon:). Till then I will try Almond Oil. I'm currently using the coconut oil by the Body Shop, but I was always so intrigued by the Moroccan Oil (intrigued enough that I forgot to pick it up when I could :P) that I wanted to try it. As well as this one. Well, I must get only one for the start, which one would you choose?